It is important to us that students of VOX Dance Studios have access to all classes within the Performing Arts spectrum. 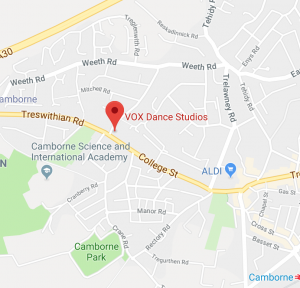 Our new modern dance centre which is based in Camborne, Cornwall, offer traditional classes which are important in a dancer’s training such as ballet, tap, modern and jazz. As well as the fundamental core syllabus classes, we also offer urban classes (hip hop, street, break and commercial etc), contemporary, drama and singing. Classes are available for all levels of experience and ability, from ages 3 years through to adults. Our classes are available from preschool age through to adults and we cater for those who have no dance experience at all through to those who are fully trained and professional dancers. We also offer teacher training courses for those who wish to gain qualifications to teach dance or those wishing to advance their current training portfolio. Syllabus classes cover the main areas of dance and form the basis of technique in all areas. Syllabus dance classes include ballet, tap, modern and jazz within the sessions and students work their way through syllabus grades. The lessons are great fun and we like to inspire each child to be challenged and grow as a dancer whether it’s as a fun hobby or to guide them in their dance journey! Urban and modern classes cover popular dance styles which have been brought to the forefront of dance in more recent times such as contemporary, streetdance, hip-hop, commercial dance and more! They are a great experience for dancers to try whether they enjoy freestyling and learning the latest cool trick or performing group pieces story-telling through contemporary dance. Classes involve students learning how to express themselves through the use of drama and musical theatre including developing character roles, public speaking, script reading and devising pieces alone, with partners and in groups. During the sessions we will look at plays, musicals, monologues, improvisation and audition techniques and students will be given audition opportunities. One of the core dance subjects which requires particular emphasis being placed on the percussive sounds made by using the feet. There are various forms of tap covered by VOX Dance Studios from the traditional style of jazz tap to the more modern “Stomp” style tap! Tap is covered within our syllabus classes. Another of the core dance subjects, this style is also covered within our syllabus classes. The style evolved from classical ballet and touches on elements of latin and jazz movements involving turns, elevation, and floorwork amongst other elements. The core subject of dance and basis for technique across all other genres and has existed for centuries! This style of dance teaches the dancer the fundamentals of dance, strength and control and well as character style dance and storytelling through dance. Contemporary dance is an free expressive form of dance that combines elements of several dance styles including modern, jazz, lyrical and classical ballet. Routines and exercises are often abstract in their choreography or following a narrative. Contemporary combines strong technique and movement with floorwork, improvisation and more. Modern style of dance becoming more popular day by day. Within our streetdance classes we cover many areas including breaking, locking, popping, tutting and commercial! Classes involve students learning how to express themselves through character roles, acting, team work and public speaking. Students will learn how to read scripts, write their own as well as perform them. This class combines singing with performance focussing on musicals performed on the stage and screen. Students learn how to correctly warm up the voice, improve projection, style, and characterisation of songs combined with movement and dance.